Joonas Riippa drums, percussion, horn, neck glockenspiel. 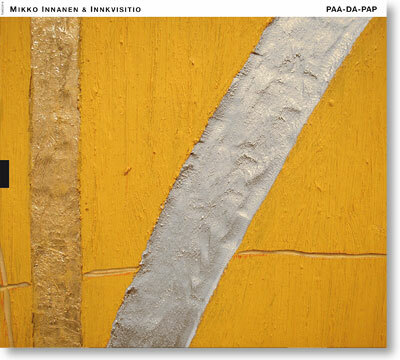 Innkvisitio, led by the highly talented saxophonist Mikko Innanen (who has led or co-led many other groups in the past, including Delirium, Triot, Gourmet and Nuijamiehet and has worked with the likes of Han Bennink, Andrew Cyrille, Joe Fonda, Lou Grassi, Ingrid Jensen, William Parker, Herb Robertson and John Tchicai to name but a few), is an energetic quartet of musicians in search of a unique new sound based upon Innanen´s multi-faceted compositions. Mikko Innanen, pianist Seppo Kantonen, who performs exclusively with synthesizers in Innkvisitio, and drummer Joonas Riippa form the nucleus of Innkvisitio, with saxophonist Timo Lassy joining Innanen in the front line on this recording. Each of these four musicians is much sought-after on the current Finnish jazz scene but Innkvisitio may well be the most adventurous of their many groups. Their debut, Paa-Da-Pap, captures the group during an innovative and vital phase, touring across Finland, as it is extracted from hours upon hours of music recorded during that tour. The album title refers to an onomatopoetic extract of a birdsong as perceived by Innanen, an analogy quite fitting to the band's organic concept of sound.